Agrianian javelinmen drive the Persian light troops into the hills. The initial scenario is presented with a ten foot by six foot table in mind. The forces are roughly at a ratio of 1 figure equals 100 men. Some units may be lower than this, and some (such as the Persian levy) may represent denser formations. The units are derived in most part from the OOB presented in Part I. Part III offers plenty of information to try out, if my analysis doesn't excite the reader. most of the compromises are related to game presentation, to fit WAB's peculiar game style. The large amount of miniatures needed will suit this mostly for team play. A few scenarios will be presented, an unbalanced "historical" scenario in which the Persians are roped into their historical mistakes, and looser "gamey" scenarios which allows a more balanced game, but shift the edge to the Persians. Finally a smaller OOB is presented for play on a six foot wide, by four feet deep table, for those who just wish to play the game and gain an introduction to the battle. All troop listings are taken from "Warhammer: Alexander the Great." Army points are not considered from the OOB, although in a free form game on a six foot table both sides could play out with up to 2500 pts. and pick their own army composition, but this can really challenge the Macedonians. Coastline: Defines where the ocean begins, Ocean is impassible to all troops. Marshy Channel: This area only obstructs march and charge moves... units may only move their normal allowance if they cross the marshy channel during their move. River: This part of the river has no effect on game play.. the river was wide but not deep in these places. Ford: Cavalry may not "march move" across this terrain. Only normal moves are allowed. Cavalry may charge across the river but may only move their normal movement allowance, and lose any special formation effects the turn they charged. In effect a wedge flattens out if charging across the rockier parts of the river, and massed cavalry loses its rank bonus. Rocky River: Cavalry may not declare charges, or march move at all across this terrain. Only normal moves are allowed, and the river counts as an obstacle. In any case where a cavalry unit is forced (via pursuit) to charge across the stream a wedge flattens, and massed cavalry loses its rank bonus. Formed infantry may not march move across the river in these places, but it does not count as an obstacle for them normally. Low Escarpments: This terrain is on the Persian side of the river only. Formed units lose their phalanx benefits if attacking up the escarpments, from the river side. Attackers and defender's retain their rank bonus. Units defending behind are not affected, and attacking down towards the river are not affected. These escarpments do not affect movement, but add +1 to the Combat Result of the defender if any attacker crossed escarpments to attack. Once a unit defending an escarpment loses a round of combat , it loses the +1 bonus, as it has been pushed off the crest. High Escarpments: This terrain is past the ford into the hills to the table edge. Cavalry may not cross this terrain, unless forced into it by rout or pursuit. Formed units lose their phalanx benefits if attacking across the escarpments, from either side. All units lose rank bonuses, if attacking across. All formed troops pay twice the normal movement costs in this terrain. Low Hills: The light brown terrain is the high ground as it gradually undulates upwards towards the Amanus range. The hills only affect Line of Sight and do not confer any combat results bonus. Higher hills: The darker brown areas represent the steeper slopes inland. These count as hills for combat results. Formed troops may not march move or charge across this steeper ground. Light Woods: This represents rough scrub and low trees. These count as light woods and obstruct Line of Sight, and obstructs movement. The units in play are deployed according to the map above. Persians are in pink. Macedonians are in blue. The numbers correspond to the OOB manifest that follows. The following OOB is presented as a suggestion only. Obviously it will be a rare even that allows players to gather a thousand miniatures for a single game. Feel free to use this as a guideline. Mike Bruck offers a "safe and sane" OOB that he built from this info, which is presented later. *Armed with axes and small shields. These count as hitting at S4 during the first round of hth combat. * Units marked may not operate as skirmishers. ** Units represent many more than 1:100 troops, and are subject to special rules. The game will not develop like the historical battle unless some constraints are imposed on the players. Again these may be used in total, or players may choose which special rules to apply to their games. Set up according to the diagram above. The Macedonians always take the first move. Special rules: Players should use all the AtG special rules for Persians and Macedonians. The Great King rule must be used. Alexander may re-roll one of his side's Oracle pools. 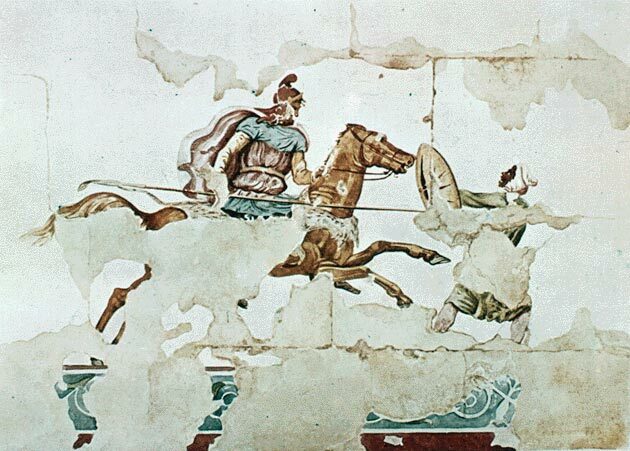 Oracles: The Macedonian player has three pools of Oracles. 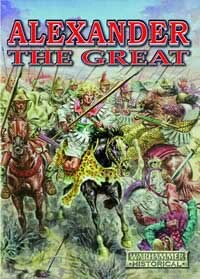 Alexander gets 2D6. Parmenion gets 1D6 and Coenus gets 1D6. Parmenion and Coenus may only play their oracles on their own command within 12". 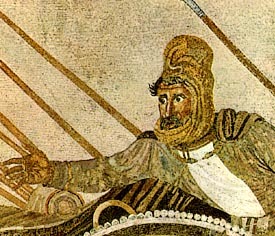 Alexander may play or add oracles on any units within 12", even those under another commands, up to the normal limits. At the start of the game Alexander may give up to 2 oracle points to each sub-general. A Commander's oracles may not be used if he is fleeing or killed. 1) Players may not swap troops with other players. Other players will only gain control of another player's troops if the model representing that character is killed or runs off the table. 2) Players may elect to set up a 5 minute conference talk period before their turn starts, after this there is no more talking between them unless their character models are within 12" of each other. Players may talk amongst themselves freely during the opponent's turn, but should not confer away from the table. 3) Persian player C and D may be combined into one command. Persian Command paralysis: The Persians seemed to be in disarray as the battle started. They made no initial movement to counter Alexander's actions. On the first turn only Command D is active and may move or declare charges. On turn two, command D, and up to two other commands may move their troops or charge, chosen by Darius. On turn three all Persian commands may move and charge normally. All units may counter-charge, react to charges, and shoot normally. Persian Light Infantry: Kardakes and Mardians may not skirmish. Only Takabara may skirmish and reform. Persian Levies Infantry: The units of levies may not move, charge, shoot, or reform, unless they pass a leadership test each and every time they wish to do so. In the case of a charge passing this check also passes any 'fear' tests. Players may well wish to not even put these troops on the table. However, the Persian player should mark where they are deployed with deployment trays, or some other method to show that these troops are still blocking movement. Assume the units do not move, but only will leave if they fail panic an they are immediately routed off, no longer parked on the table edge. 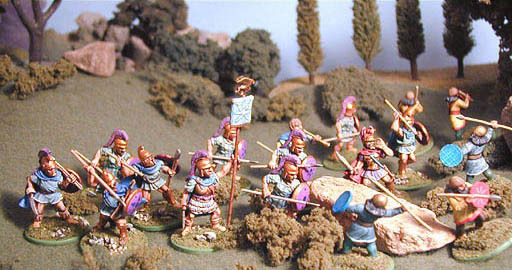 If the invisible levies rule is chosen, then remove one unit of Alexander's Greek League hoplites to compensate. Game Length: The game should last at least six turns. After that twilight sets in. If Alexander hasn't won by then, he deserves a draw! Optional rules: Players should consider using the mixed armor rules for this scenario. Victory: Darius wins if they draw, or kill Alexander... Alexander wins if Darius is killed, routs off the field, and/or the Persian army is reduced to break point. This game will allow the Persian player limited freedom to thwart Alexander. Each player deploys his commands within their deployment zones. The Macedonians always take the first move. Deployment: Commands must deploy with some portion of each unit within 12" of their commander. (Commands may not be spread out all over the table, they must stay within command at the start at least). Each side must deploy one unit from each command with the Persians going first. 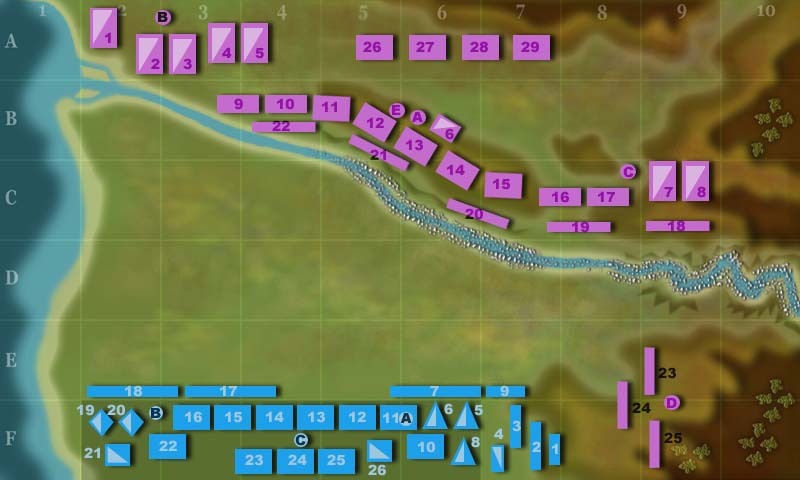 Thus the Persian player will deploy 5 units first, then the Macedonians will deploy at least three units, each from a different command. Characters deploy last as one selection. Persian units deploy behind the Pinarus river. Command D must deploy in areas E8, E9, F8, F9. Macedonian troops are deployed in their deployments zone. Skirmishing foot may deploy outside the box but must stay within 4" of the deployment zone in Row E. Units 1,2,3,4 may deploy in area F7. Add in other scenario rules above to taste, or leave them off to give the Persians an extra edge. Victory: Use normal victory conditions. 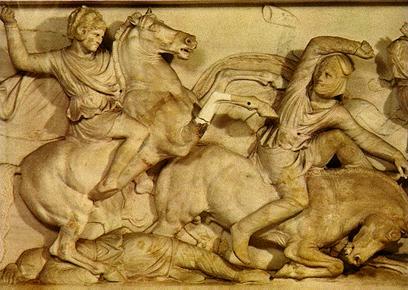 If Alexander is killed then the best the Macedonians can achieve is a draw.. This game will allow the Persian player full freedom to thwart Alexander. Each player deploys his commands within their deployment zones. The Macedonians always take the first move. Deployment: Units may be placed anywhere in their deployment zones as described above. Troops may deploy irrespective of command restrictions. Persian cavalry and light infantry (but no Kardakes) may deploy within 6" of the river, on the South side. Mike Bruck's "Safe and less insane" scenario! Try the scenario rules with the following OOB and a table scaled down to 6-8 feet by 4-5 feet. Mike suggest this for gamers to wet their whistles for the big game! Allow both sides to choose their armies within 2.5K for the small table, and within 5 k each for the big table.